by G.M. “Doc” Lousignont, Ph.D.
Optimize your Equinox for peak “QUIET” performance. We have a lot of new detectorists as well as detectorists who have never used a Minelab machine before going through a learning curve with the Equinox. The most common problem seems to be that new Equinox owners feel the detector is noisy and they are not sure how to calm the machine down. Here are some tips from Doc, your resident expert. DETECTING TIPS: I know when you see detectors in pictures you always see the coil cable neatly wound around the lower and upper stem. The cable is usually secured with Velcro® wraps. Run the cable straight up the lower rod from the coil, securing it with Velcro® wraps. Once you get to the mid rod, then you can start to wrap the coil cable, and secure it with wraps until you plug it into the back of the machine. You want to be extremely careful about the wrap you put on the coil cable down by the coil. Make sure you leave enough slack so when you lay the machine down, with the coil flat on the ground, you have enough play in this coil cable that you are not stressing it. Why do you not want to wrap the coil cable around the lower rod? Have you ever seen one of those enormous electro-magnets used in a junk yard to lift cars? Well inside that big disk is nothing more than a bunch of wound wire. When electricity is ran through it, it creates a magnetic field. Well the same thing can happen with your coil cable when it is wound on the lower rod. You turn your detector on, it sends energy down the coil cable, and when it is wound around the lower rod, you have created a magnetic field right above your coil. This can desensitize your coil as your detector struggles to adjust itself to a magnetic field it can also cause erratic behavior. The other issue that can cause noisy operation is having the sensitivity too high. Sensitivity is a big issue. People assume the higher the sensitivity the deeper the detector will go. Not true. Run the sensitivity too high and the detector spends all of it’s time trying to adjust to an over-sensitive machine instead of finding worthwhile targets. You must understand all of the fundamental operations of the detector. So download and printout that manual. You don’t have to memorize it all. But you should work through the manual with your detector in hand and learn all of the features the detector offers. A lot of the features such as the tone, you may set once and never set again. Other settings you may learn to appreciate and always use them in given circumstances. The manual is available for download on Minelab.com under Equinox. Cell phones are another big issue. Seriously! A major issue. Turn your phone off and get it as far away from your detector as possible. Put it in your backpack, up and away from the detector. Minelab’s Detector Interference Free (DIF) technology significantly reduces interference with an operating metal detector, when the pinpointer is switched off, by disengaging the pinpointer coil’s magnetic field.? Noise Cancel is a very important and critical feature of all Minelab Detectors. What Noise Cancel does is it searches for interference or lack there of. When it finds an interference free channel it locks onto it and uses it to provide you with a relatively noise free channel of operation. Nothing is perfect, and neither is NOISE CANCEL, but you can help Fine Tune the Noise Cancel feature. #1. Is there a known source of interference nearby? Another Detectorist. High Power Lines. Cell Towers or Antennas on the tops of mountains? Aim your coil at the suspected source of interference. Press the settings button, (It’s the GEAR looking icon in the middle under the screen.) Keep pressing it until in the lower left corner of your screen a circle with a hash mark through an up and down depiction of noise appears. That is your NOISE CANCEL mode. Now hold your detector steady, while aiming the coil at the suspected interference source and push the CHECK MARK / “X” button on the right side of the control pad just to the right of the “+” plus button (You can also push the “+” button) This starts the Noise Cancel procedure. The detector cycles through channels looking for a clean channel. It will stop on what it thinks is a quiet channel. It will display a number from -9 to 9. These represent the channels. Is the detector still a little noisy? No worries. We are going to manually look for a clean channel. With your detector still aimed at the suspected source of interference. Push the “+” plus, or “-” button and you will go up or down the channel setting changing the channel. So let’s say that your detector ends up during auto-noise cancel on channel 7. When you push the “-” MINUS button it will go to channel 6, then 5, then 4, etc. When you press the “+” PLUS button it will increase the channel. Often you will find during AUTO-NOISE cancel that the number ultimately displayed let’s say -3, may not be perfectly quiet, but the channel right next to it is. So manually adjust it to -2 or -4 and see if you can find a quiet channel. #2. You don’t know where the interference is coming from or there is relatively no interference. Put your coil on the ground. Now leaving the back of the coil on the ground, tip the front of the coil up at about a 45 degree angle, So from the side your coil it should look something like this __\— That’s a bit more than 45 degrees but you get the idea. Now slowly turn around 360 degrees, make a mental note of where the most interference is coming from. When you find that noisy spot, stop right there. Hold your coil still and go through the AUTO-Noise cancel outlined above, and the MANUAL NOISE Fine tuning using the PLUS or MINUS button I described above. Doing a Noise Cancel on the ground, is important. If you don’t know where the interference is coming from, chances are good it is micro-wave interference or EMI. These sources bounce around. You want to cancel them at ground level because that is where your coil is going to be doing the detecting. After deciding on best channel, hit the DETECT button which is the BLACK button with the icon of a coil on the left side of your control button panel, to the left of the MINUS button. Remember, every time you change your mode, or turn your detector back on, you must do a Noise Cancel again. Changing the mode, changes the sensitivity of the machine and hence your must go through Noise Cancel again to compensate for the new settings. Also, a note regarding the Equinox 600, it does not have the ability to manually adjust the Noise Cancel channel. Now Balance your machine. Once again click on the GEAR ICON until you cycle through to the ICON of a coil with an up and down arrow. This should be to the right of the NOISE CANCEL icon that showed up in the lower left hand side of your screen. At first hold the PLUS “+” button down and pump the coil up and down against the ground about 6 inches. Listen to the sound. The coil will sound different either going away from the ground or going towards the ground. That is because your detector is not properly balanced. 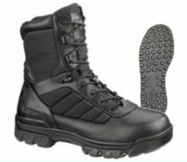 If you are getting a louder sound going away from the ground that means your detector is NEGATIVELY ground balanced. THIS IS VERY BAD! You will lose a lot of depth and it will be noisy. If you get a louder sound going away from the ground hold down the PLUS button, because the way to get the detector out of a NEGATIVE BALANCE is to ADD POSITIVE ground balance, this is done with the POSITIVE “+” button. Likewise, if you are getting a louder sound when the coil goes towards the ground you are out of balance on the POSITIVE side. The way to get the detector back in balance is to hold the negative button down “-” as this brings the POSITIVE balance down and gets the detector back in balance. You want to use the POSITIVE and NEGATIVE button while pumping the coil up and down until you are either getting no sound, or the sound is the same both going towards the ground and away from the ground with your coil. I know it may be a bit confusing, but let me try to simplify. LOUDER SOUND GOING AWAY FROM GROUND = NEGATIVE BALANCE – PRESS POSITIVE BUTTON To Bring the detector into balance. LOUDER SOUND GOING TOWARDS THE GROUND = POSITIVE BALANCE – PRESS NEGATIVE BUTTON to bring the detector into balance. SAME SOUND GOING TOWARDS OR AWAY FROM GROUND = PERFECTLY BALANCED DETECTOR. When the detector is balanced, push the TARGET / DETECT button in the middle at the bottom of the Button Control Panel. ADVANCED SECRET: Running your detector slightly out of balance on the POSITIVELY balanced side will give you extra depth, BUT it is quite noisy and prone to falsing. I hope these tips and tricks will help new comers to get their Equinox to purr like a kitten while detecting, and roar like a lion when it finds a target. 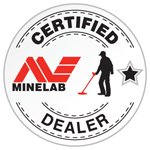 Doc – Certified Minelab Gold Machine Trainer 26 years a Certified Dealer with Minelab. © 2019 G.M. “Doc” Lousignont Ph.D.